Looks like all pop culture icons *are* created equal .... at least when they are turned into Lego! If it was good enough for Madonna, and the Beckhams, and even the Beatles -- why not Ziggy Stardust? 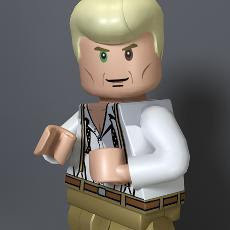 Meet the Thin White Duke...yes, David Bowie has been Lego-ified in the upcoming 'Lego Rock Band' game. Some might say it's a marriage made in rock 'n' roll, and gaming heaven, mixing 'Rock Band' with all playthings Lego. "Modern Love", anyone? You've got to give kudos to the Lego artists -- they even nailed David's blown pupil in his left eye. Not to worry music purists, Bowie will have debauched company in the form of one Iggy Pop. Yep, he's been given the plastic treatment too. If anyone can withstand it, Iggy can! Hm. Actually Mr. Jones' eyes aren't two different colors. They're both blue. However, the left eye looks darker because he has a paralysed pupil. Totalblammblamm, thanks for clarifying. Now that the Beatles and Bowie have been immortalized in Lego, I don't think anyone is safe. The Lego Rockband went to the top of my Christmas list when I heard about it this morning. I have to have it!